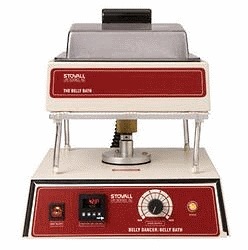 The Belly Bath is the perfect system for protocols such as Heat Activation of Serums, Restriction Enzyme Digests, Lowry and other Protein Quantitative Assays, and DNA Sequencing Applications using Sequenase or Taq Polemerases. This light weight mobile system features a quick to temperature heating element and precision control. It combines the gentle undulating motion of the Belly Dancer with a heated Water Bath with control built into the Belly Dancer.